There are different schools of thought on how to throw a left-hook, especially across different combat sports. Some believe that a pivot must be used for power (boxing and kickboxing with a strong boxing influence). Then there’s the belief (more often Muay Thai schools of thought) that if one commits to a left-hook with the pivot, he’s exposed his entire hamstring and back — becoming vulnerable to a power kick. Another reason is that if the left-hook is too committed, it can’t swiftly set up a kick — whereas the less committed, pivotless left-hook can. As with most techniques that have diverging schools of thought, they’ve proven to be effective at the highest levels — giving some evidence that they all of a time and place. This breakdown looks at the left-hook in kick-fighting and its special relationship with right-kick. Generally, leading with the left-hook in long-range has a higher degree of risk, as does doing a low-kick lead — thats why it’s generally safer to set up either shots. Feinting is one of the ways to setup its entry — in this sequence, Buakaw feints one of his staple weapons — the lead-leg teep. Notice how David Calvo raises his leg as a reaction, Buakaw quickly steps in for a speed left hook (not meant to hurt). The left hook did not find a mark, but it served many purposes: a) it cleared and measured distance by backing David up, b) it made David lean slightly towards his lead leg (where Buakaw is going to attack, making it harder to check), c) load up the right low-kick by maintaining the lead-leg loaded and heavy: the left hook put Buakaw into the optimal right low-kick stance. Buakaw stands just outside of Calvo’s teeping range, takes a small step forward which draws the teep. He then catches the teep, lets go of it and goes for the most committed left-body shot possible, moving his entire body into the left hook. Attempting a heavily committed shot without breaking the posture is a surefire way to get punished. Breaking the posture is key in landing something like this, making sure that the committed shot has a clear time of entry. Buakaw was consistently reading and catching David’s teeps. After the catch he’d load up a left hook into roundhouse again, and the principle remains similar to the right-low kick. Note: After the left-hook, if Buakaw’s head placement is to his left or neutral (e.g. off a speedy hook) then it’ll be a faster transitioned roundhouse. If his head placement is more to the right, (e.g. a committed left body-hook), then it’s a more powerful and loaded roundhouse with more lag-time. Front foot placement and knee loaded for the right-kick. Buakaw again catches the teep, only this time he has David trapped against the ropes. Notice how when he’s going to the left-hook, his weight is still on the lead-leg, allowing him to more easily come up in the high-kick. After the high-kick, Buakaw remains lead-leg heavy and goes for another fully committed body hook that drops David. Also notice how David’s posture is broken from the high-kick and being trapped on the ropes. This final left-hook to the body ended the bout. At this point David had been beaten up, and was likely going for a “desperation move”. 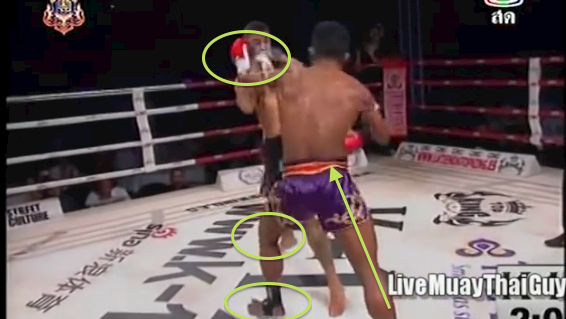 With Buakaw’s stance being upright, there’s no reason for him to go for a jumping up-knee. As a result, he lands with his stance compromised (fully open body) and Buakaw just simply stepped in for his committed-body shot. There’s a time and place for commitment and exposing the hamstring. Breaking the posture is just one instance. *The shot hit the liver first and then slid down. Though Buakaw is not one to dramatically pivot his foot, the timing is there for him to do so. Stay tuned for more Buakaw breakdowns! To stay updated, you can find Lawrence Kenshin on his social media accounts below.